Dive into an intriguing adventure in a magic country where fairytale and magic rule! Restore a wonderful city to its former glory, make friends with its folks, help the prince to save the princess and unveil a mystery! Solve puzzles and find the words for secret spells to make friends with a unicorn who values those who have a brave heart! Unlock all lands and decorate the fairy garden to get magic pets as a reward. 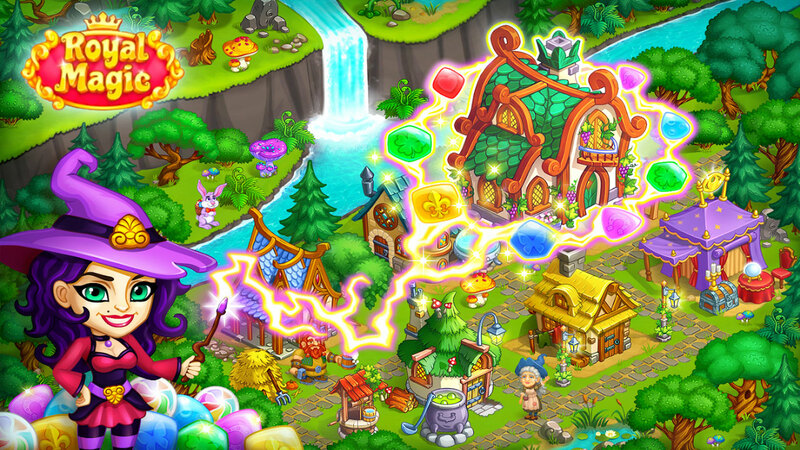 Renovate enchanted locations and meet dozens of cute characters – witches, wizards, magicians, fairies, dwarves and giants. Get a new treasure every day! Get a tamed speaking dragon as a pet, give it candy, train it, and settle your new pet on a farm or in an enchanted castle. Magic abilities of quirky animals will help you beat endless match-3 levels. Play solo or invite your friends to help you unlock all animals and their cartoon stories. Our new free game will give you many sweet memories and glorious victories in a magic world! Related Tags: ROYAL MAGIC MATCH 3.